Bed Bugs: Unfortunately, you have to worry about them everywhere. They aren’t just in the sleazy motels of urban centers like Los Angeles and New York. They aren’t just in the run-down apartment buildings of the slums. They are everywhere – including all across Arizona and right here in the Valley Area. In fact, ABC 15 reports that the Maricopa County Department of Environmental Services verified a total of 81 cases of bed bugs during the first 11 months of 2017. The department says it gets hundreds of complaints about bed bugs each year, but not all of those complaints turn out to actually be bed bugs. The confirmed cases included 16 public locations, including movie theaters, schools, and even a coffee shop. Not only are bed bugs very hard to get rid of, but they can also easily spread. You can visit a movie theater, for example, and bed bugs that are in the seat can follow you home on your clothes. Then you have bed bugs in your furniture, and your real nightmare begins. It’s important that you learn a little about how to find bed bugs in your home, as well as how to get rid of them and keep them out. If you do find bed bugs, you should call a pest control company in Mesa immediately. Some DIY methods will help, but you really need a professional exterminator to get rid of them as quickly as possible so they don’t have a chance to spread and create a stronghold in your home. Fortunately, bed bugs are fairly easy to spot. But you will have to do some looking. Get down on your hands and knees to look at the seams and crevices around your furniture. Look at the seams of your mattress and the cushions on your couch and chairs. Look at the area where the wood legs on your bed or couch meet the underside. Bed bugs like to burrow in those areas. Bed bugs are flat, round, and reddish brown. The adults are typically the size of an apple seed, so you definitely won’t have to squint to find them. But if you have a lot of babies, you may not realize what you are looking at right away. The bugs could look like specs of dirt or even blood. You may not see the bugs themselves since they are nighttime critters. So you can also look for signs that they’ve been there, such as a trail of feces or blood along the seams of your mattress or furniture. You can also check your own skin for bed bug bites. Just check with a doctor to make sure that they actually are bed bug bites – a lot of other bites can look similar. The best way to get rid of bed bugs is to call in a pest control expert in Mesa. You are likely to see advertisements for traps, mattress protectors, and other tools for getting rid of bed bugs, but these all have a limited effectiveness, and they take a long time to see any results that they do provide. You can even buy your own insecticides, but we wouldn’t advise it. Bed bugs are quickly evolving to become resistant to most insecticides. Only a professional exterminator will have access to the latest and most effective solutions to eradicate bed bugs. You won’t be able to get this strength of insecticide yourself, nor should you since they are dangerous chemicals that can hurt you and your family if not used properly. The professionals also have effective, non-chemical tools to get rid of these pests. One of the best ways to ensure your home is free of bed bugs is to take a proactive approach against them. Keeping your home clean and free of clutter can help. You should also inspect your clothing and luggage after you have visited a hotel or other public place that may have bed bugs to ensure that you haven’t come home with any unwanted visitors. The best thing you can do to keep out bed bugs is to inspect your home and your furniture regularly. The earlier you can detect their presence, the easier it will be to get rid of them. 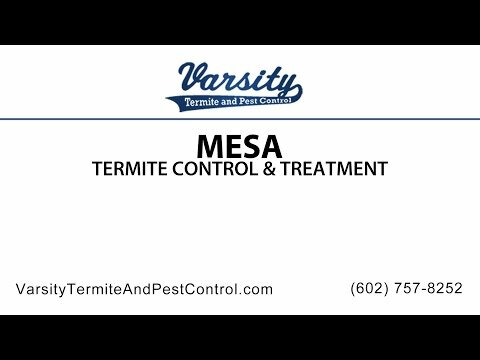 Varsity Termite and Pest Control offers affordable pest control in Arizona, including eradicating bed bugs from homes and businesses. We can ensure that your home or business is safe and comfortable so you don’t have to worry about these pests again. We also offer affordable pest control for other common, Arizona pests, including scorpions, spiders, roaches, roof rats, and more. Work with an exterminator from our team to create an ongoing pest control plan to keep your property free of all the creepy crawlies you don’t want. Call us in Arizona today.